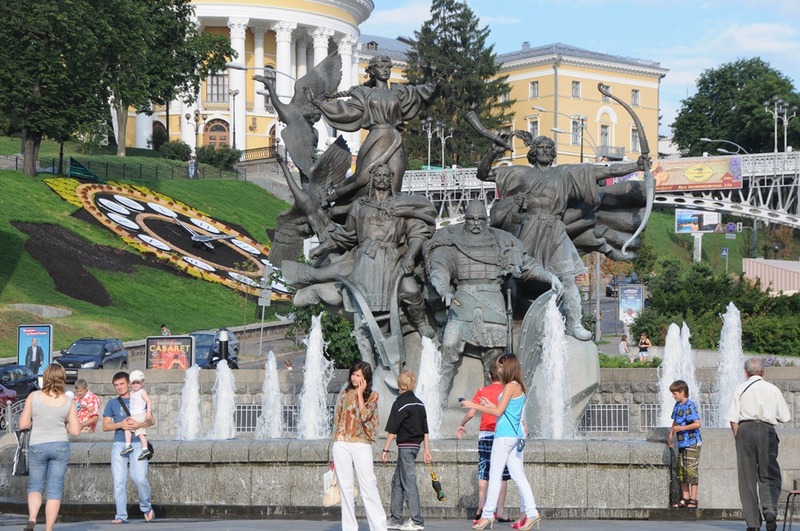 A trip to Kiev will often start right in the heart of the city on the most important street, the boulevard known as the Kreshchatyk (Крещатик.) 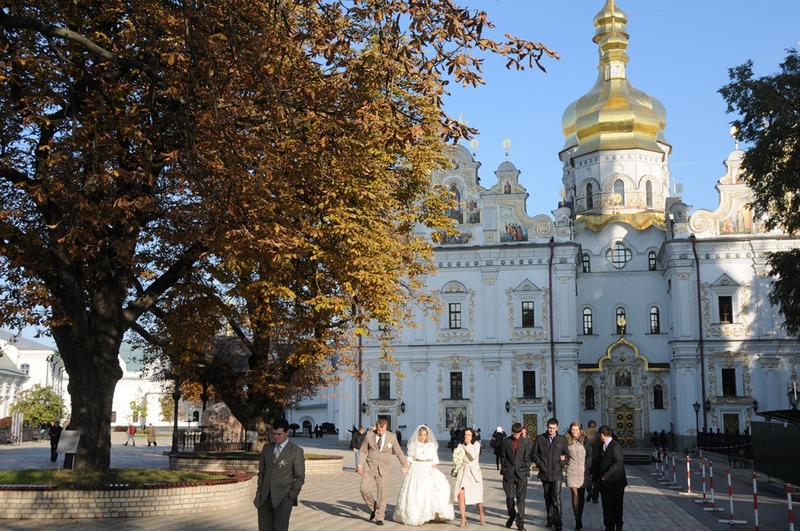 This street is Kiev’s Champs Elysees, and it is where you can find couples, families, and friends strolling together down a beautiful tree-lined corridor bustling with life. The Krechyatyk in it’s current form was built after World War II, as during the war the street was infamously dynamited by retreating Soviet forces during WWII who didn’t want the Germans to be able to use them for their own purposes. Following the end of the war, Stalin specifically organized German prisoners of war on work details to rebuild the buildings as a form of restitution for the damage incurred in Kiev during the bloody war. Taking a close look at the buildings on the Krechatyk is a curious way to discover relics of past Soviet emblems such as the Hammer and Sickle (Серп и молот, ☭), a traditional symbol of communism that was also famously on the flag of the Soviet Union. 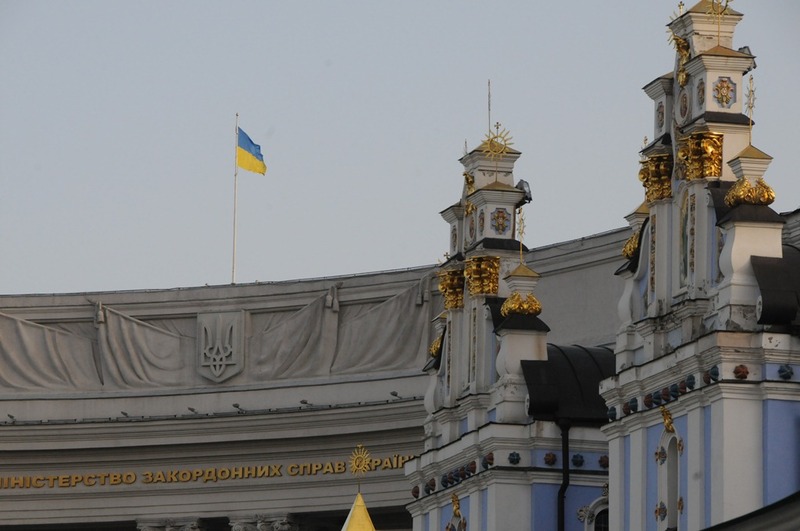 The north end of the Kreshyatyk ends at the public square known as Maidan Nezalezhnosti (Майдан Незалежності), translated as Independence Square in Ukrainian. 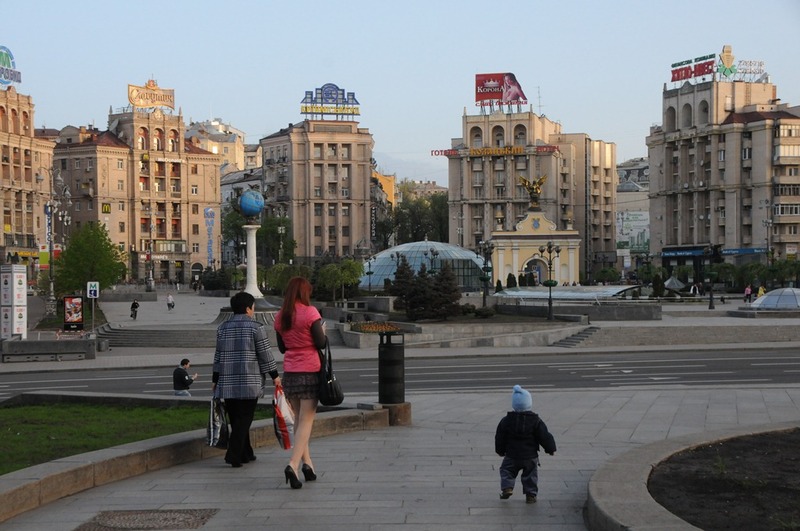 This square was previously known by several names, including the name “October Revolution Square” during late Soviet times. 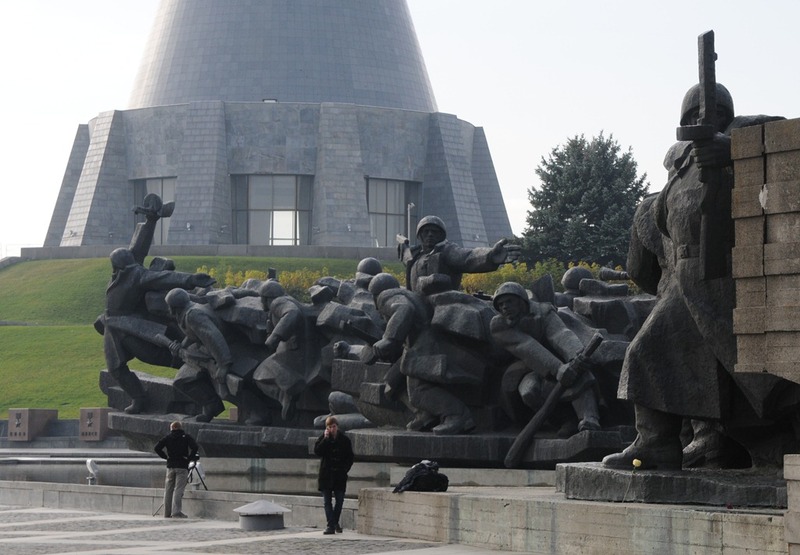 New monuments were installed and Maidan Nezalezhnosti was renamed in honor of Ukrainian independence in 1991. 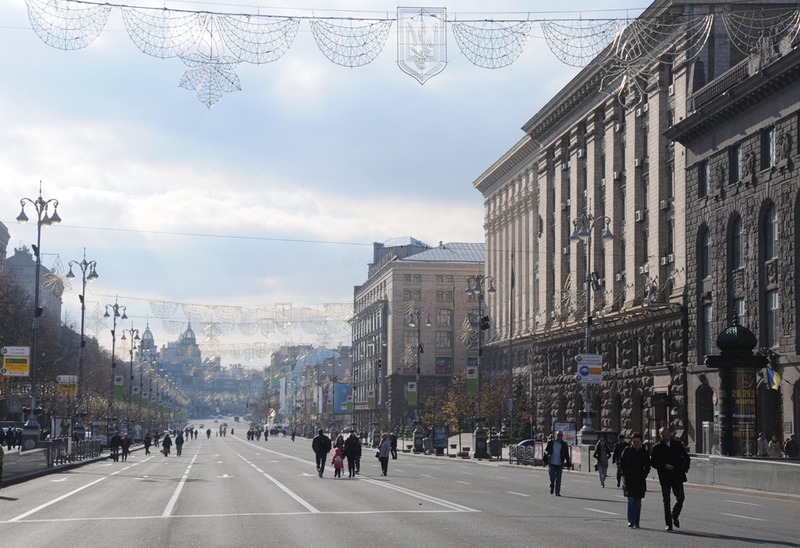 Independence square was also the location of the massive protests that were referred to as the ‘Orange Revolution,’ when Ukrainians protested against what they perceived to be a rigged presidential election. Independence Square has changed significantly from when I first visited it. At that time, it was watched over by a huge communist sickle and hammer and was filled by street vendors selling pirated CDs. It has changed significantly in the meantime, the sickle and hammer is hidden behind a large jumbo television screen now, the street vendors are mostly gone, and neon advertisements shine down from above. 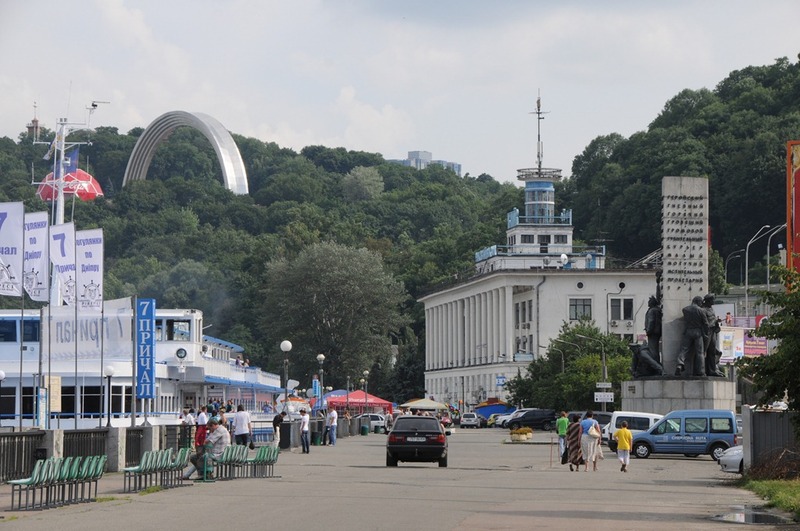 The Square is most definitely a social hub in Kiev, and you can find the youth of the town there in the evenings relaxing, socializing, drinking beer and eating salted fish and other snacks. 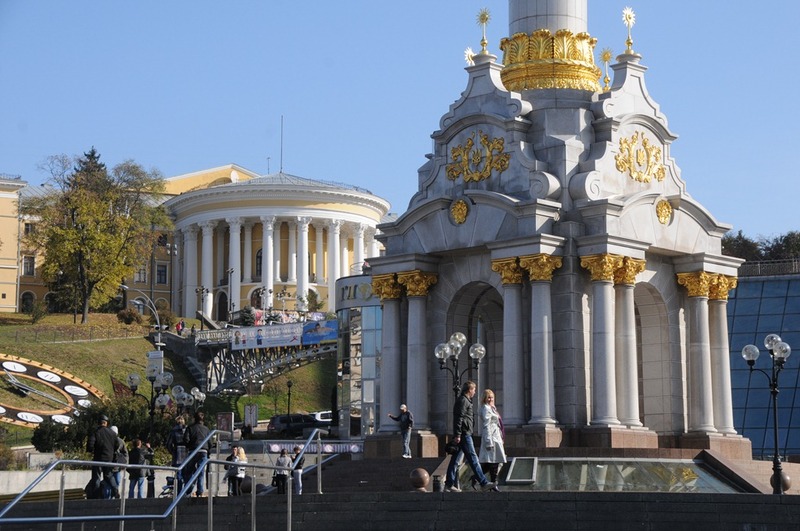 Kiev is particularly well known for its architecture, and the city contains a beautiful mix of new architectural styles together with ancient and historic structures. Of particular note is the famous St. Sophia Cathedral (Собор Святой Софии), built just over 1000 years ago and named after the famous Hagia Sofia Cathedral of present-day Istanbul. 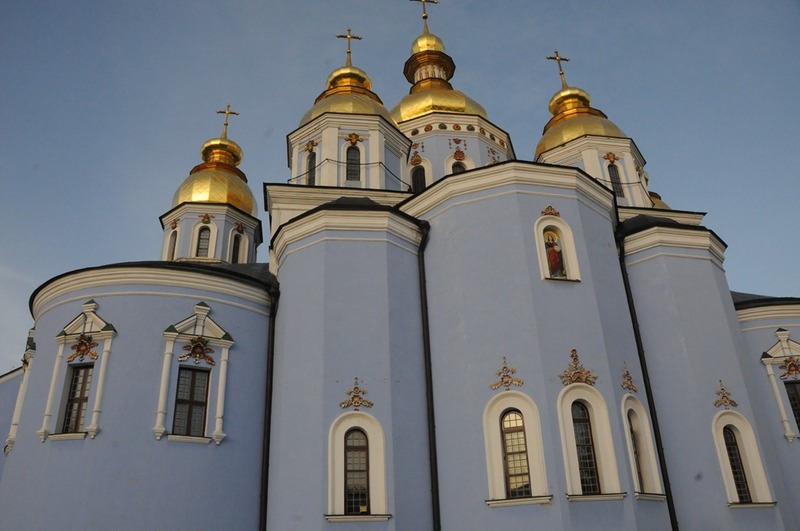 The church of St. Sophia is currently run as a museum, and does not belong to one specific denomination, as returning it to church control is complicated by the fact that it was controlled by several churches over the years, before being forcibly converted to secular use during the Soviet period. What’s most incredible is that the Soviet authorities actually considered demolishing this historic structure during the early part of the Soviet period. After all, the Soviet Union was officially atheist, and one of the first churches in Slavic Eastern Orthodoxy was considered a threat to communism . 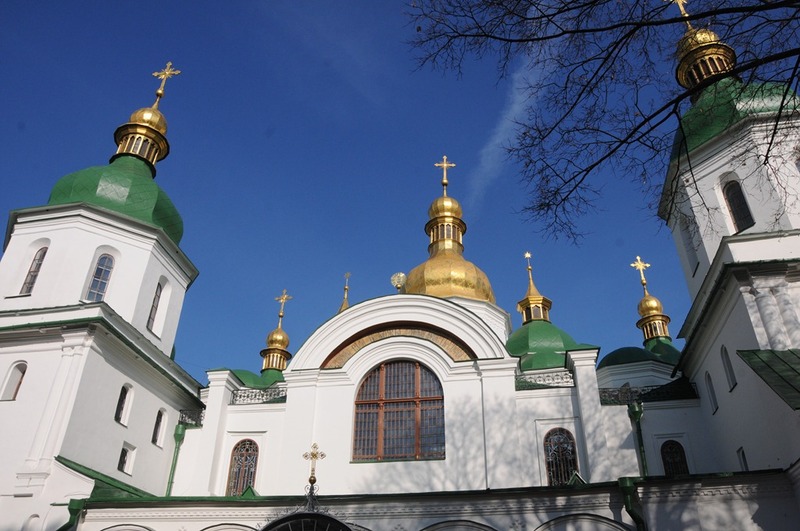 Fortunately, the building was spared, though other historic churches in Kiev such as the Church of the Tithes and the St. Michael’s Golden Domed Monastery were unfortunately and foolishly demolished. 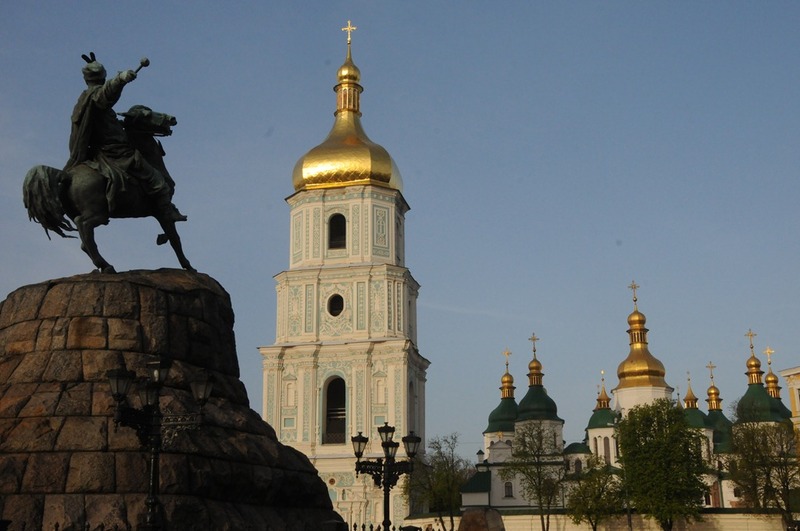 St. Sophia Church sits upon a hill adjacent to a central square that includes a large sculpture of Cossack hero Bohdan Khmelnytsky (Богдан Хмельницкий), who briefly led an insurrection against Polish control of Ukraine during the 17th century. 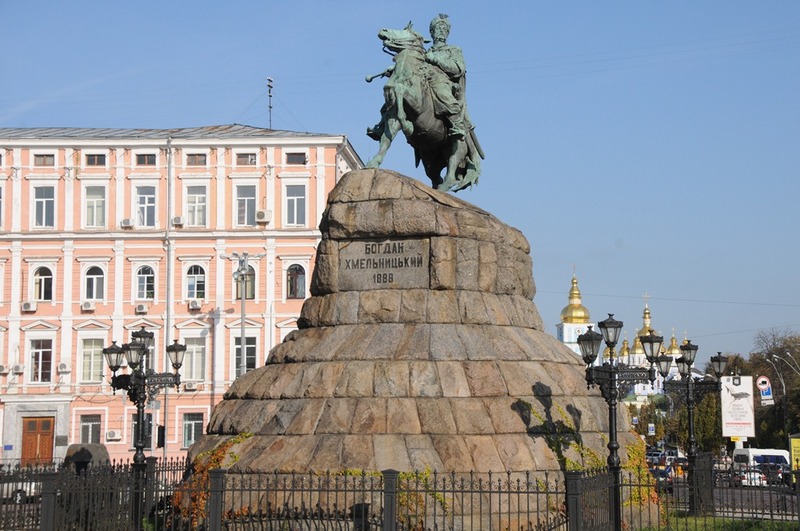 Khmelnytsky, while seen as a Ukrainian folk hero to some, is a bit controversial, however, as he also effectively turned control of Ukraine over to Muscovy (present day Russia,) which would end up retaining control of Ukraine until independence in 1991. Just down the street and visible from St. Sophia is the newly rebuilt St. Michael’s Gold Domed Monastery (Михайловский златоверхий монастырь.) 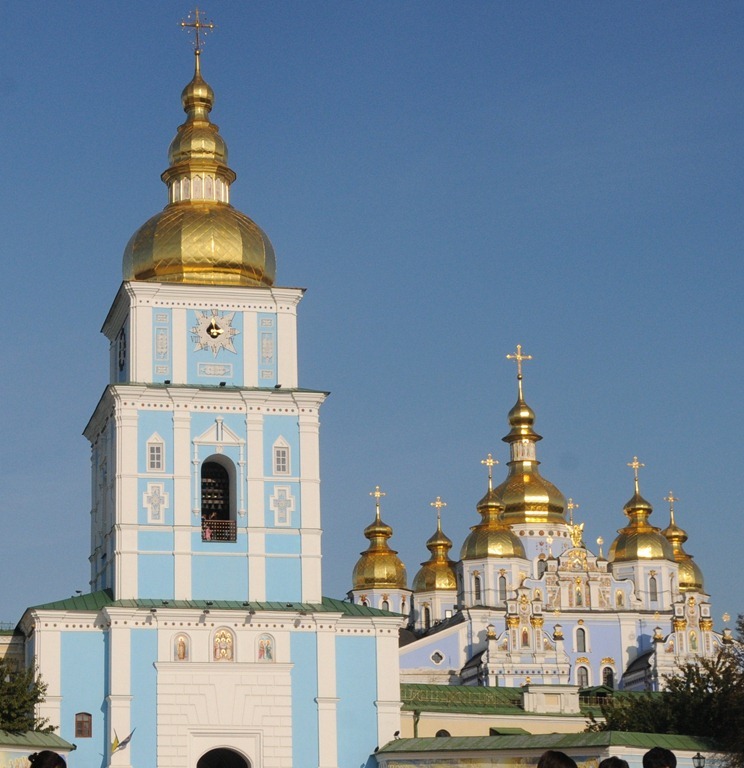 As pointed out earlier, the Soviets foolishly destroyed the original monastery, but it was meticulously rebuilt after Ukrainian independence to as close of the original specifications as was possible. 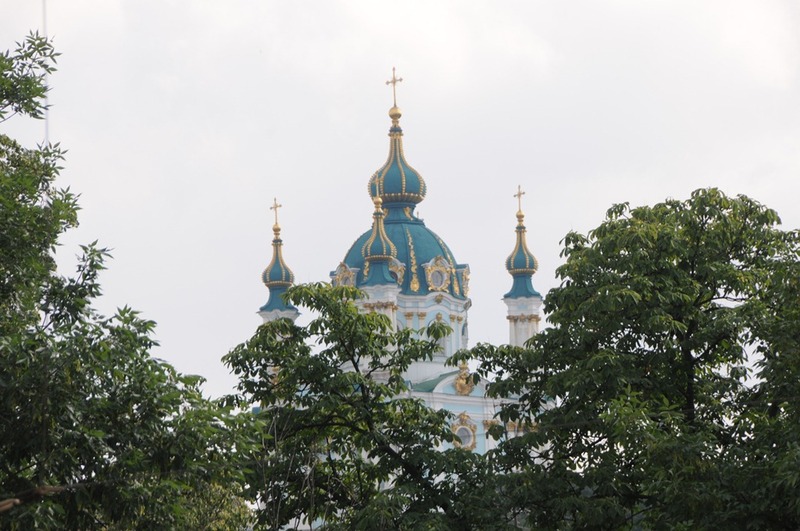 The rebuilding of the monastery is part of an effort in Kiev and in Ukraine as a whole to restore some of the heritage that was lost during multiple devastating wars and the heavy hand of communism. 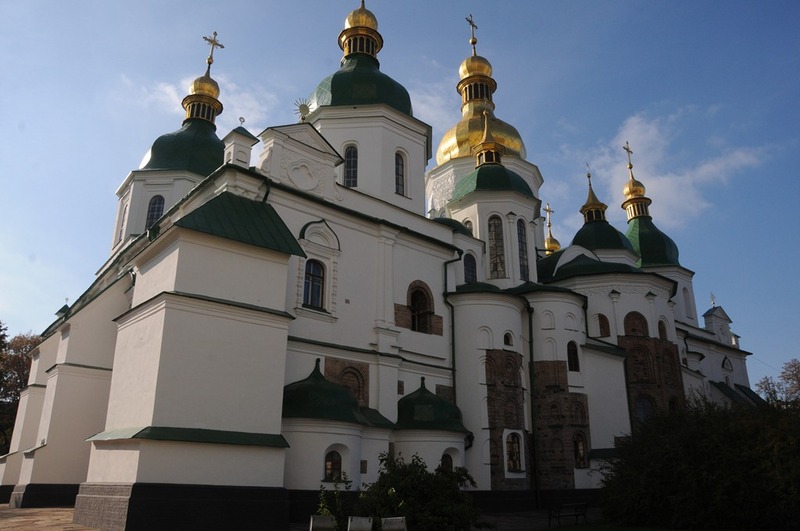 Unlike St. Sophia, this set of buildings is controlled by the Ukrainian Orthodox Church, and is used as an active monastery. 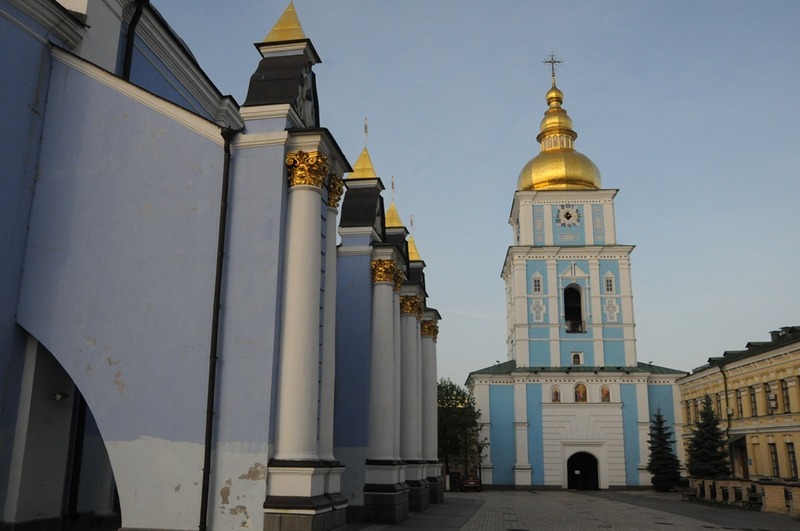 Beautifully reconstructed, the bells of the monastery are set to chime every hour, sounding out various traditional melodies written by Ukrainian composers. It should be pointed out that there is a bit of controversy in how the latin script form of the word ‘Kiev’ is written. The new, official spelling of the city name is ‘Kyiv,’ which matches with the Ukrainian form of the city name (Київ.) The Russian spelling of the city (Киев,) has been traditionally used when writing about the city, however. I try not to take sides in this conflict, but for the ease of the western audience refer to Kiev by it’s traditional, rather than the new spelling. Kiev Pechersk Lavra (Києво-Печерська лавра), or the Monastery of the Caves, is an incredibly special place in Kiev. 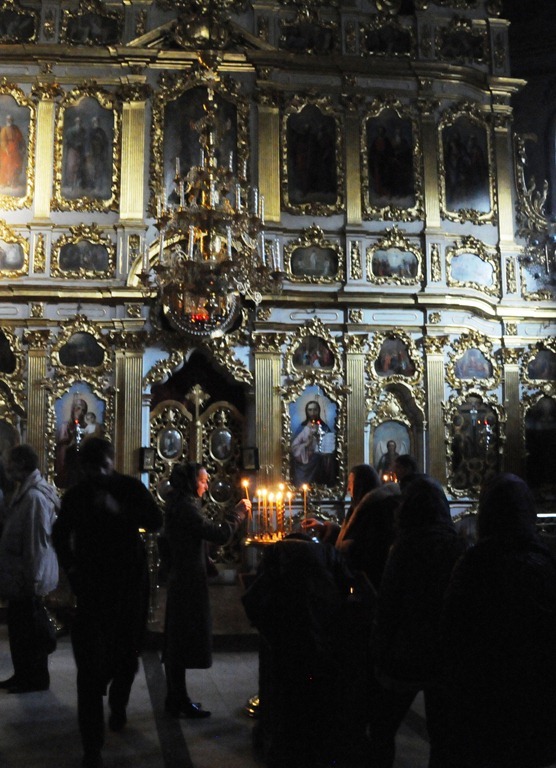 It is a complex of buildings near the Dnieper river that house some of the most sacred relics of Slavic Orthodoxy. 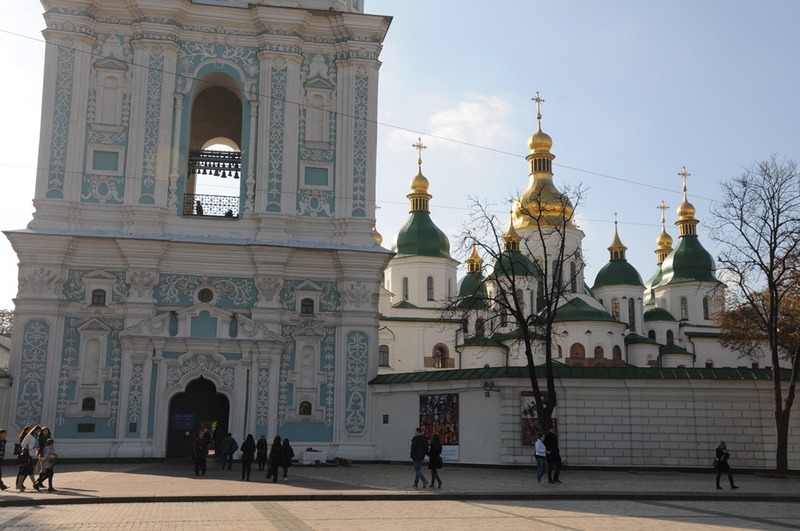 Build in 1051, the complex includes a large belltower known as the Great Lavra Belltower, as well as the Gate Church of the Trinity, the All Saints Church, and the Church of the Saviour at Berestov. Underneath the monastery are a series of caves called the Near Caves (Ближние пещеры) which religious pilgrims traverse, guided only by the light of their candles. These caves include the burial crypts of ancient Slavic saints, important figures in history, and purportedly the head of Pope Clement I. These sacred caves may be visited, with tourists and religious devotees packing the corridors. It is here, in these caves in 1999, when I witnessed the truly moving sight of an elderly woman weeping in the candlelight, hunched over the tomb of a saint, a truly spiritual moment. 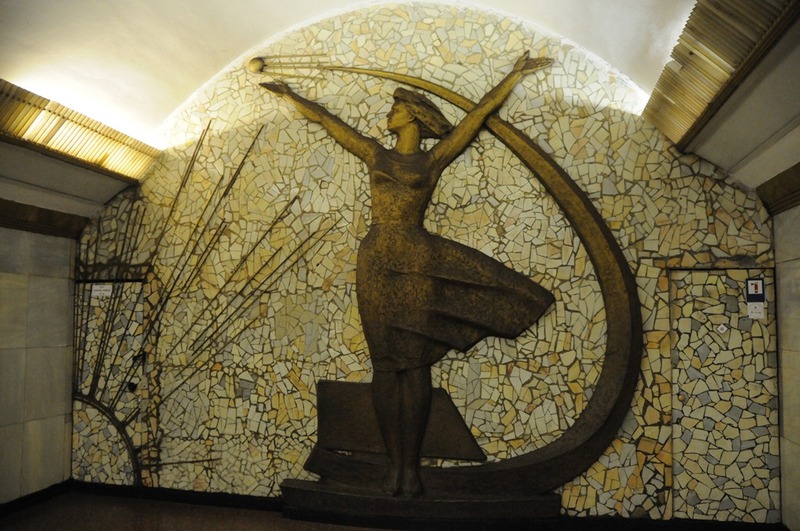 The memory of Kiev’s role in World War II can be found near Pecharsk Lavra in the unmistakable form of the Mother Motherland statue (Родина-мать, pronounced as ‘Rodina Mat’) a massive stainless steel statue meant to commemorate the defense of the motherland by Soviet troops during World War II. It is difficult to truly describe the horrible toll that the war had on the citizens of the Soviet Union. Over 20 million people died a violent and miserable death, and great cities such as Minsk and Kiev were reduced to rubble. Nearly every family suffered losses, and the scars of the war are still healing today. Incidentally, the statue was built to be slightly higher than the Statue of Liberty, a throwback to an era when communist authorities were always trying to ‘one up’ the West by making monuments and buildings taller and more impressive than other famous ones in the West. 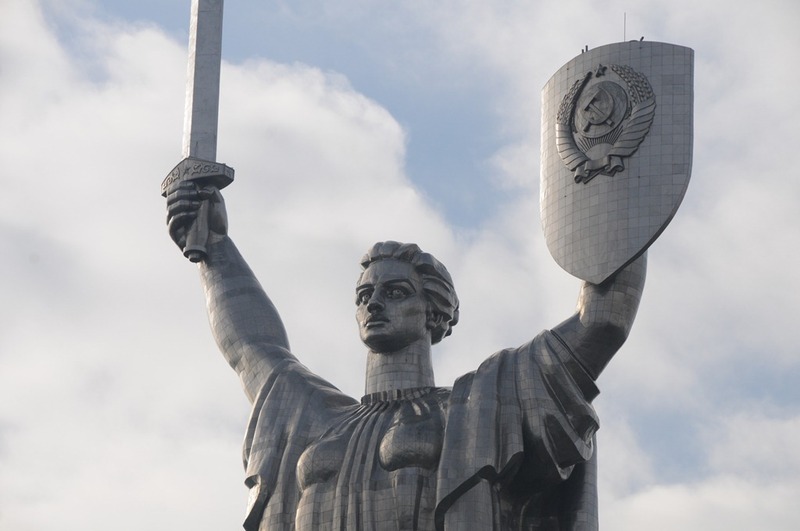 The complex in which the statue of ‘Rodina Mat’ is located is home to a large outdoor museum of WWII called the Museum of the Great Patriotic War, which includes some massive statues depicting Socialist Realism depictions of World War II fighters. 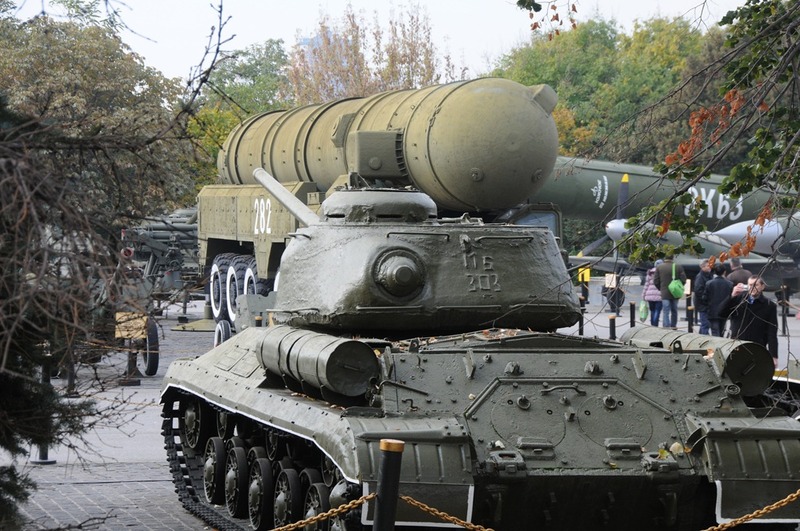 A large interesting display of Soviet military machinery can also be found within the park, displaying WWII tanks, artillery, and aircraft. 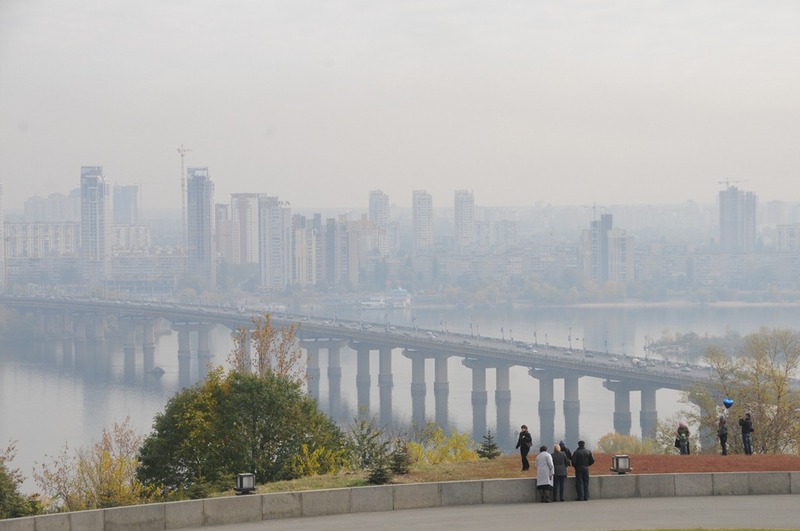 The Dnieper River cuts through the heart of Kiev and is indeed the reason for the city’s existence. In the summer, you can find residents swimming and boating, and in the winter they can be found huddled over a hole in the ice, looking to catch some dinner for the evening meal. The waterfront can be easily accessed on foot from the Kreshyatyk, and the main docks in the town are the location where you can catch a cruise along the river, a highly recommended diversion that will allow you to take in the multitude of gold domes spread throughout the city. Just upstream from Kiev on a tributary of the Dnieper is the location of the former Chernobyl nuclear power plant and the ghost city Pripyat, which was evacuated after the explosion and fire that took place there in 1986. Kiev was spared much of the effects of the nuclear fallout (Belarus instead took most of the brunt of it) but the proximity of the plant to Kiev is a stark reminder of the limits of human accomplishments. I’m told you can take a bus tour of the exclusion zone, though I haven’t had the opportunity to do that yet, I can imagine that it would a sobering sight. While many vestiges of Soviet life have been swept away after Independence, you can still find a few around if you look for them. 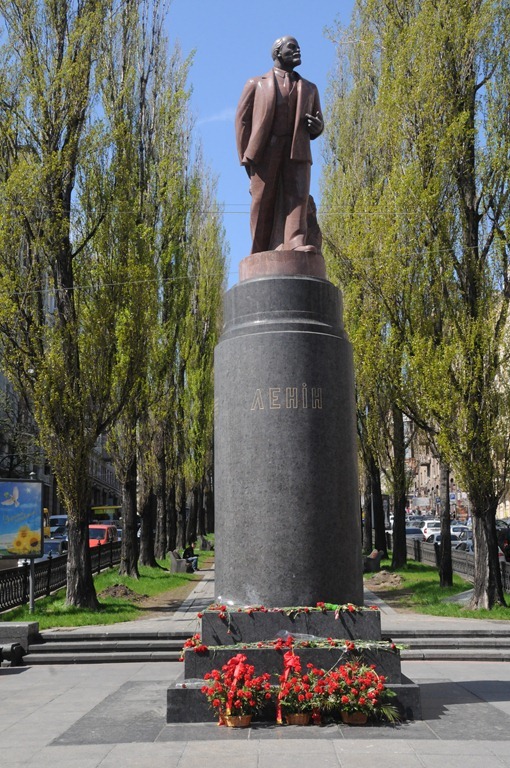 The most obvious is one of the remaining statues of Vladimir Lenin, the communist leader of the Soviet Union who was venerated during Soviet times. 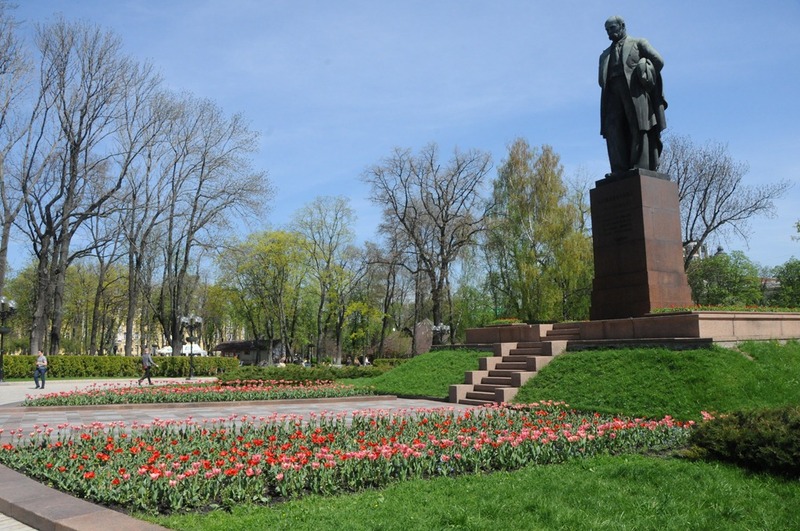 What’s interesting to note is that his statue still receives fresh flowers in Kiev. Kiev, and Ukraine in general, is blessed with some amazing produce. 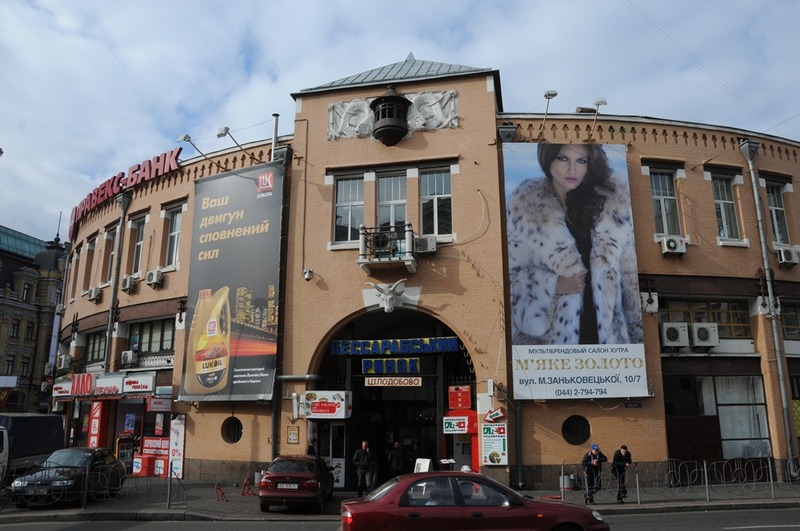 The most famous and interesting place to view this produce can be found in the Besarabsky Market (Бесарабський ринок) a roofed farmers market that is the location for some of the best produce in the area. Ukraine has some seriously amazing food, and this market in particular carries local specialties like melt in your mouth sala (pig fat,) crusty rye bread, zimliniki (wild strawberries,) local pears, tvorog (farmer’s cheese,) picked vegetables and much much more. The Kiev Metro (subway) system is also worth a visit, as it is one of the deepest in the world, and many of the stations were built in the lavish style similar to that used on the Metro system in Moscow. 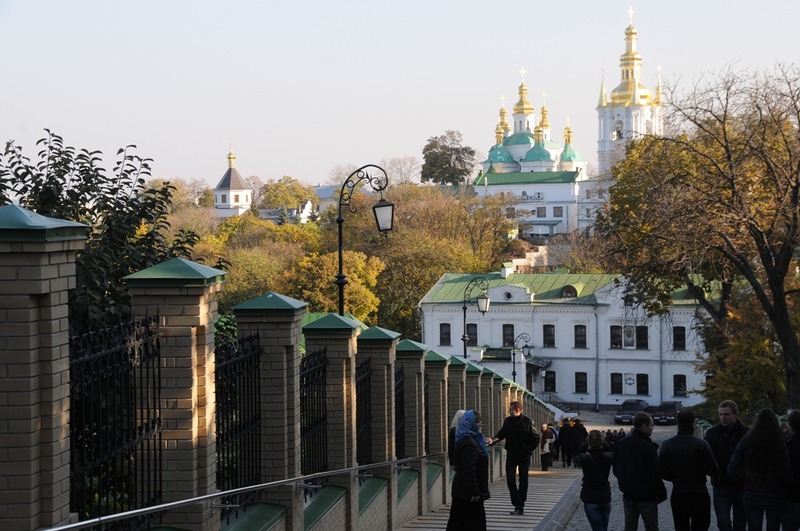 One of the most famous and picturesque neighborhoods within Kiev is known as Andrew’s Descent (Андре́евский спуск,) a region of the city that starts at St. Andrew’s Church and snakes down the hill towards the river along a cobblestoned street filled with local art vendors. 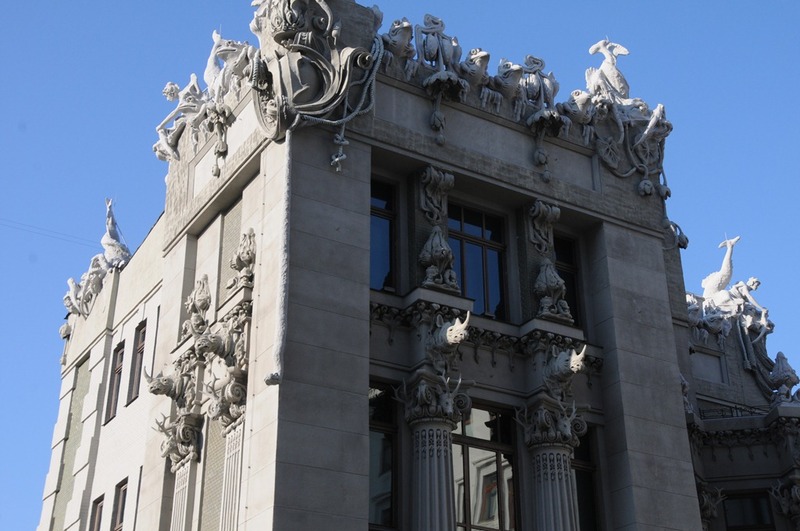 One particularly bizarre sight in Kiev is the ‘House with Chimaeras’ (Дом с химерами,) an Art Nouveau house that is covered by sculptures of strange and exotic animals. The house is directly located across the street from the office of the President of Ukraine, and is well worth a look. 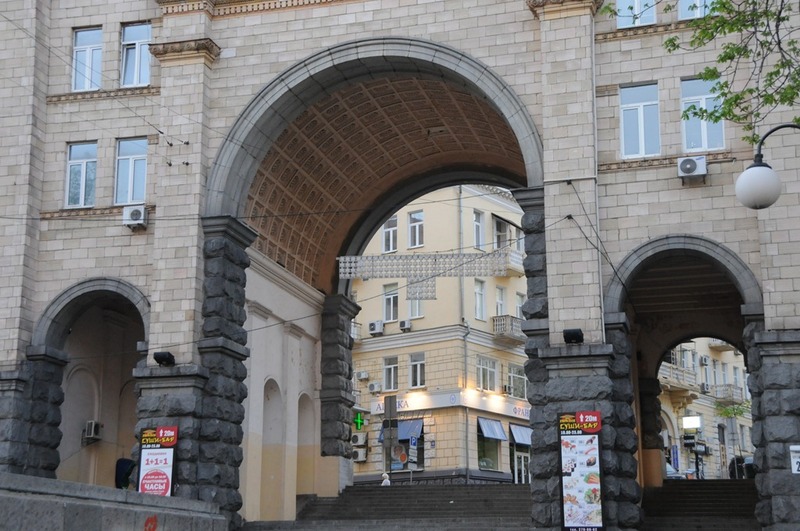 Another architectural gem of note in the city is the final surviving gate of Kiev from historical times that was part of the Golden Gates of Kiev. 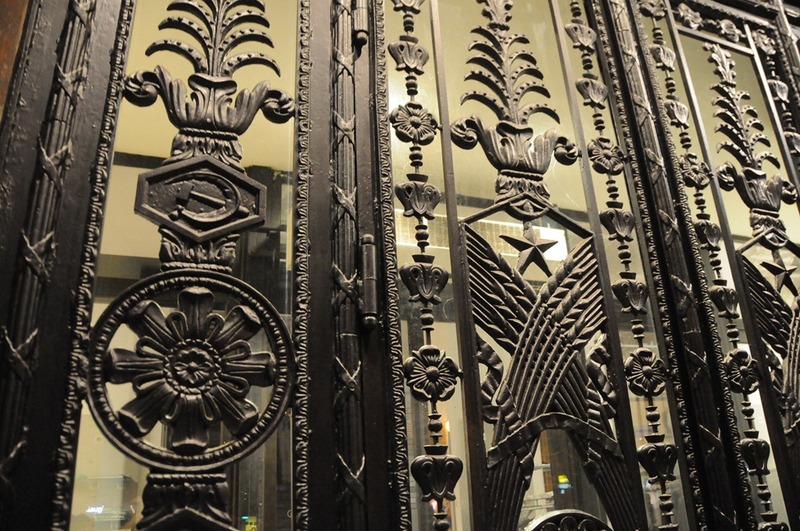 The heavily restored gate can be found close proximity to Saint Sophia and the Krechyatyk. 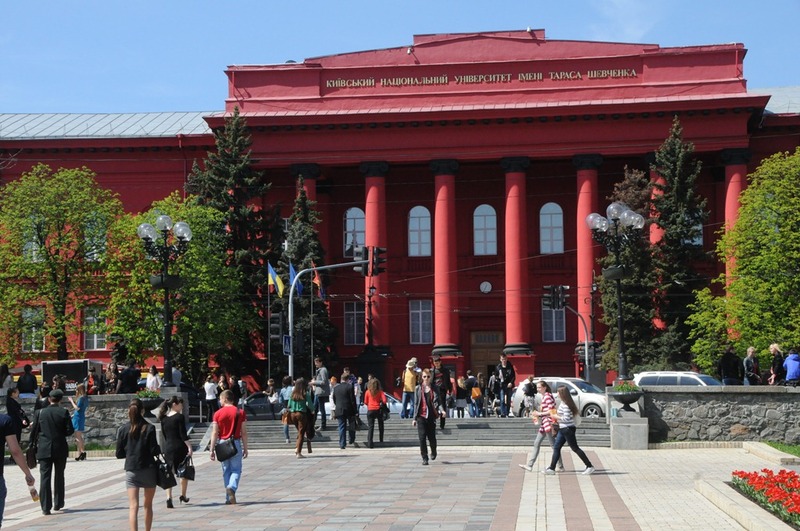 A short walk from the Bessarabsky Market past Lenin and up a tree-lined street takes you to Taras Shevchenko University, the oldest University in Kiev and the location of the famous Red University Building (Красный корпус Киевского университета,) which is said to have been painted red by the Tsar to remind students of the blood that was spilled during earlier student uprisings. The namesake of the University is the famous Ukrainian poet Taras Shevchenko (Тарас Шевченко), a literary genius who heavily influenced Russian and Ukrainian language and culture. One thing I will tell you about Shevchenko’s poetry, is that it really needs to be listened to in the original Ukrainian, as he had an amazing ability to let the words flow together into a hypnotic rhythm. 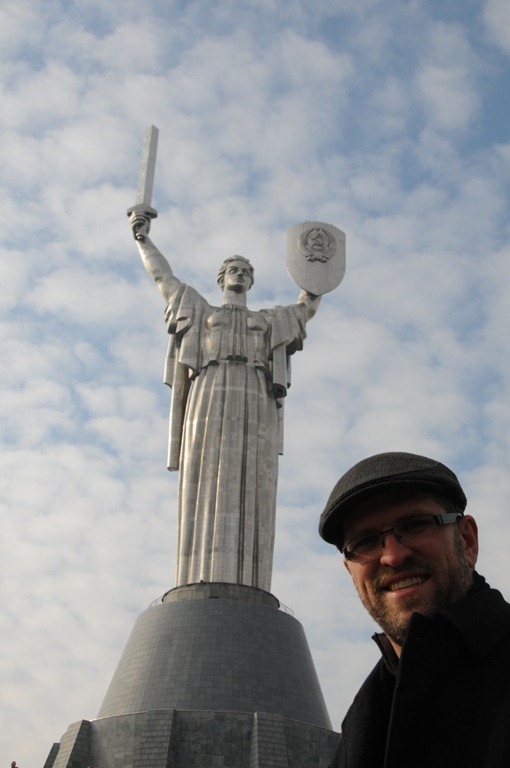 Ukrainian is a beautiful language to begin with, and Shevchenko had a knack of turning it into a masterpiece of culture. And on that note, I leave you with Taras Shevchenko’s most famous poem, entitled, ‘Testament.’ As for Kiev, I hope to return here often, to savor the beauty of the land, the sparkle of the golden domes, and this amazing country of Ukraine. the sounds of the river flowing. I will not know God. Don’t speak poorly of me.